Understanding and learning to engage productively with internal collaborative communities and social technologies is a vital work skill. The capacity of an organization's agility, productivity and innovation is in large part based on the tacit knowledge and know-how of today's (cross-generational) workforce. In a knowledge economy, it's the talent and knowledge of people, and the results of their productive interactions that create value - the ability to solve complex problems or invent new solutions, and engage with customers in more authentic and compelling ways. What are some of the essential practices and capacities of working social and what are some of the skills and mindsets you need? Adaptive adeptness - If your company or organization is rolling out enterprise social networking (ESN) and other collaborative tools and technologies -- learn them -- pro-actively. If you're new to a tool or a new social environment, try setting small goals -- take ten minutes a week and explore two new functions or features. I set a goal of 'tool of the month' and try to dig deeper into something I'm relatively new to or haven't yet tried. Suggest that a project team begin to use the ESN environment together. Cultivate a robust enterprise identity - Old-style company directories may list the official, but often non-descriptive job title of an employee, basic contact information and maybe their immediate manager -- it's essentially your assigned identity by the company. Rich profiling and transparent work streams in enterprise social networking environments provides a broader platform for you to convey not only relevant background and credentials (your claimed identity), but your activity streams can also create an understanding of your recent work and projects (your performed identity). Your knowledge, experience and background matters, to you, to your company or organization and to your colleagues. Developing a robust profile, and activating and evolving your identity helps colleagues and co-workers readily discover and tap skills or knowledge they may need. It can also help team members develop insight and affinity more quickly as new projects start up. A richer enterprise identity provides more agile talent discovery for internal recruiting, and creates a reputation advantage for you by making your various social roles (i.e., answers questions, contributes to communities of practice) and social feedback (likes, comments, contributes to streams) more broadly visible (your recognized identity). Use activity streams to work transparently - Enterprise social networking systems provide activity streams to support the transparent, interactive, persistent threads of work streams, shared artifacts, and discussion comments. There are several key value points in those characteristics -- transparency lets you bring in, or add colleagues to an activity stream - all interactions are visible and persistent in one thread - no more email rat-holes. Relevant objects or artifacts to a project or team work stream can be attached, and versions easily identified. Various contributions from team members are easily discerned and key issues, concerns or contributions viewed. Varied modes of interactivity and response are often available -- commenting, and adding your voice and expertise to the work stream, adding affirming tags such as a 'like' identifier, a 'favorite' tag, an ability to quickly share specific content from a stream. Many offerings also support integration with email and other productivity applications. Mobile interfaces also provide a range of access points. Varied contextual alerts let you and your colleagues know what is happening in key activity streams. Tag it now-find it when you need it - One of the key benefits to ESN is it's searchability of activity streams, people, communities, and artifaccts in the the organization. Whether you initiate an activity stream, or join a team using ESN for project work, it's important to identify and agree as a team on a small set of relevant tags. Simplicity is the watchword - but doing this as a part of the activity stream set up will help with information flow and group productivity in the near-term, and allow the results of your work to be discovered across the organization later. Be a mentor, become a leader - When you work transparently, and as the tenor of your productive interactions are viewed by groups and teams, you inherently model 'working social', and as such provide tacit mentoring to those you engage with. The dynamics of working social in turn supports a climate of trust that allows people to negotiate their way forward. “Where trust is the currency, reputation is a source of power.” - and is not only a driver of greater productive behavior but helps surface leader mentors. As you grow your own facility in working social you can also actively mentor others, expand your social roles across the organization, and exhibit leadership. Identify social learning opportunities - ESNs offers easy opportunities for communities of interest and practice to flourish outside of work group or projecct teams. Such communities can help you advance and accelerate your own professional development, and support your own capacity for mentoring others and gaining affirmation for your skills, experience and abilities. Look for ways to tap into these kind of informal resources. Here are my earlier posts in this series. 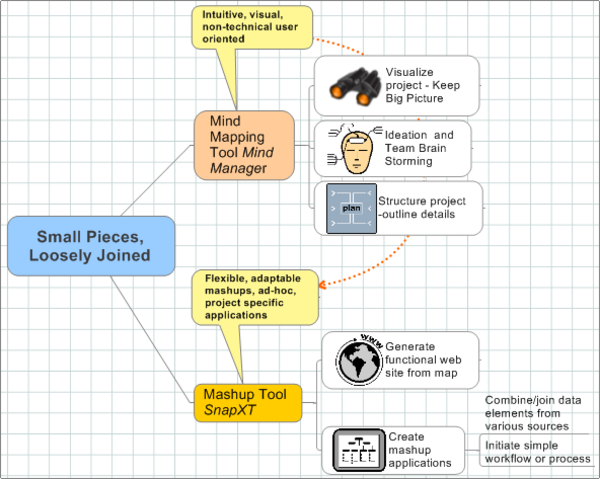 Sometimes combining basic tools form powerful collaboration mechanisms. I’ve been surprised that the concept of mind mapping wasn't discussed as a relevant and powerful mechanism for collaboration at Enterprise 2.0. I’ve been a user of mind mapping through the use of MindJet’s MindManager product for some years, and have mentioned to various people at MindJet that their desktop application would be extremely powerful if they brought it into the Web 2.0 world. At the Enterprise 2.0 conference in Boston last month, I saw that SnapXT has done just that. Using MindManager as the user interface, a non-technical, knowledge worker can create web pages and mash-up applications. The MindManager tool allows the simple structuring and visualization of a web page, or a project portal and SnapXT joins, or snaps the applications and data elements together. When I used MindManager in a corporate enterprise workplace a year ago, I found it useful to help a team outline a support process between the company and a partner organization. In other cases, I used it to help a team brainstorm the structure of a proposed online community. While MindManager itself does have many points of integration with other desktop applications, SnapXT enables simple mashups that would integrate with other enterprise business systems. These type of tools can give knowledge workers greater access to collaboration and ability to create their own project specific application, almost a "disposable"application, useful for the duration of a project without the immense lead time and cost of more traditional applications development models. Here, in map format is an outline of the MindJet/SnapXT combination. It's a big deal when the balance of economic value of American public companies shift from tangible to intangible assets. A recent Economist profile, entitled "The Battle for Brainpower," quotes that intangible assets are now more than half the market capitalization of U.S. public companies, and, according to their citing of an Accenture study, the shift is up to 70% in 2006, from 20% in 1980. Those intangible assets reside predominantly in the domain of what is described as "tacit" interactions. Dan Pink, in his book, "A Whole New Mind: Why Right-Brainers Will Rule the Future," refers to this as the transition to the conceptual age, where the ability to form relationships, sythensize concepts, and engage in complex, problem solving, is more to the fore as a key set of skills for the modern company or organization. The Economist article focuses on the issues of the dearth of talent as an emerging business issue, and as a primary resource issue of nations. Yet they note that high talent individuals often decline in productivty for up to a year when they move from one company to the next and don't bring elements of their work teams with them (their productivty context). Companies often continue to organize and relate to their workforce as if it was still predominantly "tranformational" * or "transactional. **" The Economist defines talent simply and powerfully as "the ability to solve complex problems or invent new solutions." Lawrence M. Miller calls this talent broad-slicing in his book, "The New Capitalism" (in contrast to Malcolm Gladwell's thin-slicing concept), and articulates how broad-slicing functions at a leadership, capability and operational levels in organizations. Talented individuals don't exercise their talent in a vacuum, but often in the context of conducting their work in a team or collaborative process, whose members often represent diverse disciplines and cultures, and are often part of a global team or supply chain. Collaboration practice enables talented knowledge workers to effectively connect with their team, creates a context for and fosters an ability to synthesize to analyze complex problems to allow individuals able to "see" all the elements of a problem. A high functioning team of talented individuals can then build on their collective experience and wisdom to be even more productive on the next set of problems or innovations. Collaboration tools support those business and organizational needs. *Transformational: extracting raw materials or converting them into finished goods. *Transactional: transactions that can be easily scripted or automated. The Economist published a special survey in January 2006 on Collaboration and the High Performance WorkPlace. Two quotes from that survey seem especially compelling. "The speed and efficiency with which effective teams can be brought together to resolve problems is crucial to the success of the modern organization,"
"The more workers interact with each other often, the more likely they are to solve the problems of complexity of the modern organization." Advancing technolgies in knowledge management, Web 2.0 collaboration and social software, web-based meeting services, workspace and portal software are all evolving to address the potential needs of the modern knowledge worker who must, to be effective, work in a collaborative and team-based manner. That work puts a premium on efficient methods of assembling a team, getting quick access to proper resources and accelerating results through enhanced interactivity. The workplace software of the 90s focused on making the individual productive, and giving them simple to use, yet robust presentation, word processing, presentation and calculation and e-mail communications software. We're in an era now evolving to advance team productivity and it's rapidly becoming a key construct. often participate in teams with members that are external to a core organization: customers, partners, alliances, members of out-sourced business function, suppliers. cope with teams whose members are often cross-time zones, cross-cultural, and operate from disparate IT infrastructures. Web 2.0/Office 2.0 whatever the nomeclature. the tools needs to address these business needs.